Just as diesel users have enjoyed the wonderful benefits of Dee-Zol since the 1950s, drivers in cold weather climates have experienced better mileage and power along with superior cold weather protection with Dee-Zol Plus. 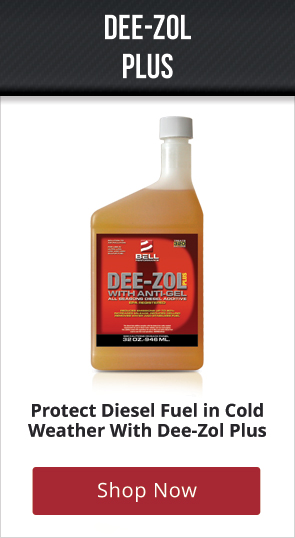 Dee-Zol Plus combines the multi-function benefits of Dee-Zol with cold flow improver that keeps diesel fuel from gelling under in cold weather conditions. As the ambient air cools down, the paraffin wax in normal diesel fuel starts to drop out of solution. These wax crystals stick together, getting larger and larger until the fuel clouds and gels. This is bad news for diesel drivers in the wintertime - gelled winter fuel can shut a vehicle down and leave the driver stranded. Conventional cold flow improver products can keep this from happening. But value-driven consumers want more bang for their buck, and that's what Dee-Zol Plus gives them. Dee-Zol Plus combines effective cold flow protection with a multi-purpose concentrated formula that increases mileage and horsepower, lowers the cetane requirement of the engine (for easier starting and better performance), reduces pollutants and black smoke, and removes harmful water buildup that can damage injectors. Dee-Zol Plus users get all this plus a cleaner engine as the concentrated detergent package in Dee-Zol Plus cleans injectors, valves and combustion chambers, restoring dirty diesel engines to like-new condition with regular use. Just one ounce of Dee-Zol Plus treats up to 10 gallons of diesel fuel and provides superior cold-weather gelling protection in most cold-weather climates.